In today’s business environment, organizations of all sizes are dealing with growing legal and compliance risks. Business leaders are looking to gain an edge in today’s competitive market and have found that a close examination of their current records programs have paid off. This industry survey of business services, financial services, insurance, technology, government and pharmaceutical records managers has found their organizations have implemented some components of a records management program. There was a need to better manage current compliance and risk-related issues as well as a desire to enhance operational efficiency, reduce cost and even improve customer service. In the survey results, you will see there are several essential records management program elements that are being underutilized and therefore represent opportunities for some organizations. One of these elements is an electronic records repository, which fewer surveyed companies (70%) have implemented as compared to a paper records repository (91%). Potential advantages of a digital repository include reduced paper storage, improved retrieval time and enhanced disaster recovery. 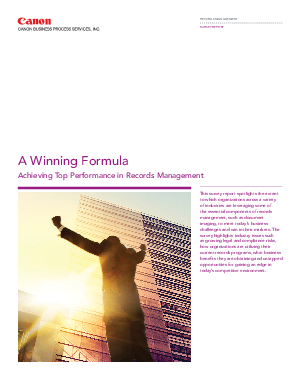 Learn how your industry peers are tackling the challenges of records management and opportunities for improvement and ultimately cost savings.